My dear, sweet Husband has found himself in a sticky situation. He dried an entire pack of gum with an ENTIRE load of laundry. 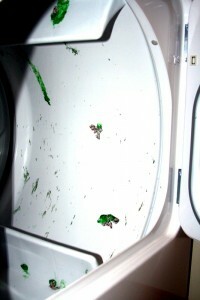 The clothes made it out alive, the dryer did not. Any ideas (other than the ever-obvious: Adam’s elbow grease)? This entry was posted in The Ins and Outs of Us and tagged Adam, Ramblings by electricnurse. Bookmark the permalink. It was somewhat easy to clean up!! How the clothes made it out alive…. I will never know!